Is This The End Of the Kettle? Yes – boiling water is like watching paint dry, it’s boring and wastes time and water, not to mention the kitchen counter space taken up by a kettle – but this is all about to change with the launch of GROHE Red® in June 2010. Whether it’s a quick cup of tea, peeling vegetables. or sterilising baby bottles and washing greasy pans, we need boiling water for many uses. The GROHE Red® is the perfect tool for every busy modern day kitchen. Consisting of a tap and a boiler (4 or 8 litre versions available), this ingenious appliance supplies piping hot water at the twist of a lever. 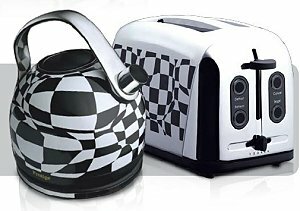 Following on from the huge success of the signature Art Deco kettle by Prestige, the company has added two new members to the Deco family. Their striking geometric designs combine with first-class functionality, to make an ideal addition to any kitchen. 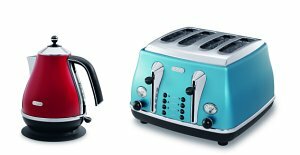 For the first time, both new designs are available in a two-slice toaster (RRP £45) as well as the popular dome-shaped kettle (RRP £60). Have you ever been desperate for a cup of tea but can’t be bothered to boil up the kettle? 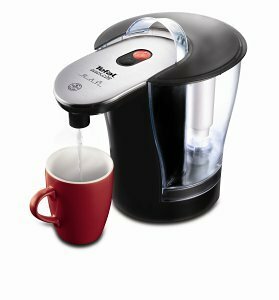 Tefal have provided the solution with Quick Cup – an extraordinary invention that serves hot or cool water in 3 seconds. It only heats the water you need and uses only a third of the energy of an ordinary electric kettle – so a great time, energy and money saver. The stylish Tefal Quick Cup incorporates a patented Opti-Quick heating system ensuring a quality cuppa at any time of the day and includes a Claris Filter Cartridge that provides fresh filtered water on tap. De’Longhi, a leader in design-led home and comfort products, is invoking the sleek and sophisticated glamour of the 1950s, with the launch of Icona, its new range of kettles and toasters. Inspired by an era that saw a worldwide revolution in music, fashion, film and design, Icona captures the essence – as seen by Italy – of one of the most influential and exciting decades. Available in five chic high gloss colours, to compliment any kitchen scheme, the Icona range includes Scarlet Red, Azure Blue, Onyx Black, Pearl White and Silver. Every smart kitchen needs a SuperKettle. 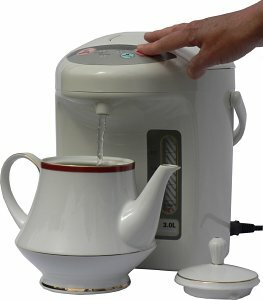 The new kettle from Newtonz Ltd maintains the water just below boiling point,(without steam) by electronic control. Fill it, switch it on, and forget it – until you’re ready for a drink; you’ll be amazed by the simplicity and convenience of boiling water available at the touch of a button. No waiting to make perfect tea, coffee etc when back from work or shopping, when you wake up, or if friends call in. 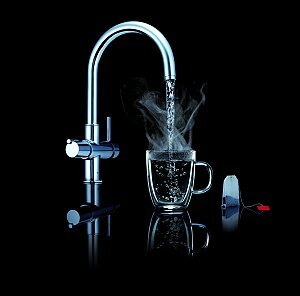 This is the revolutionary Quooker boiling water tap.